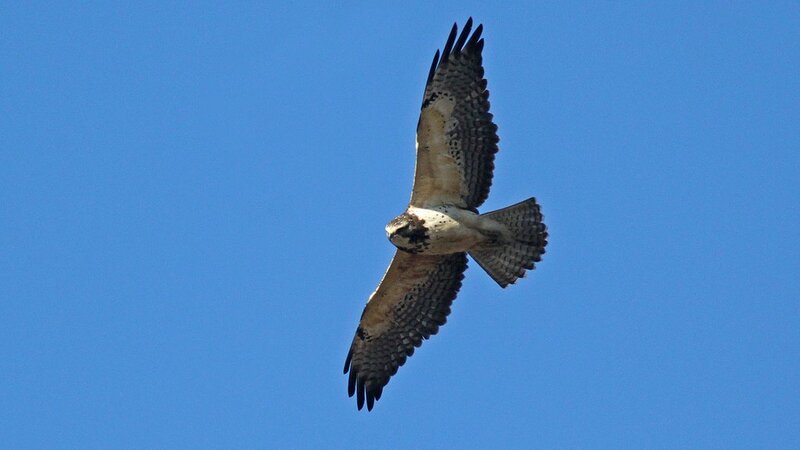 Five individual hawks consisting of two separate species are currently making waves in the Carolinas this winter. They’re not the regular ones, the common open country Red-tailed and the smaller, more suburban Red-shouldered. No, tails and shoulders would not raise eyebrows at all, let alone inspire legions of avid birders to descend on places as generally bereft of birds as Charlotte-Douglas International Airport. But these five (more or less) wandering raptors have been the centerpieces of what has generally been a pretty amazing winter for birds in parts of the southeast. Both Rough-legged and Swainson’s Hawks are no strangers to the southeast, and North Carolina in particular. Every winter for the last several years usually find one of both somewhere in the state, generally in the vast, fallow cotton fields out east where the birds can range without seeing hide nor hair of any birder (it’s always amazing to me how the 60,000 strong flock of Snow Geese that winter there can vanish into practically nothing), so their presence in and of itself is not especially remarkable, but the ease at which they’re being seen, and the sheer numbers of the birds in the state, is. A little background as to why this is such a big deal. Swainson’s Hawk is a bird of wide, open prairies. It’s primarily an insect eater, so when the northern hemisphere enters the deep freeze the world’s population of Swainson’s Hawks heads south en masse via Central America, squeezing through the isthmus of Panama in great numbers before arriving at the American west’s southern doppelganger, the pampas of Argentina. It’s one of the most impressive migrations of any raptor, up to 14,000 miles each way. Yet even though they should be living la vida tranquila in South America, three individuals, all juveniles, are currently spending the winter in the decidedly un-Latin American Alligator River National Wildlife Refuge in Dare County, North Carolina since at least November. Why? Rough-legged Hawk is a different matter entirely. It’s a tundra breeder, associated with ice and snow and found at high latitudes across the Northern Hemisphere. It has feathered feet, from whence are derived the name “Rough Leg”, and migrates south only far enough to find open country for rodents. Most years Roughlegs stay far to the north of North Carolina, but this year a pair, and more likely three individual birds, are holding court at two sites in the western part of the state. One at a sod farm near Henderson in the Appalachian foothills, and another pair dodging wide-bodied aircraft and hunting the medians between runways at Charlotte-Douglas International Airport since the end of December. Their presence is certainly not related to the Swainson’s Hawks, so why are they here? The answer may be different for both species, but the end result places them both in North Carolina. Swainson’s Hawks have a well-known pattern of vagrancy to the eastern US, particularly in fall. It’s a pattern that is mirrored in many western species for reasons that aren’t entirely clear. It could be as simple as a screwy internal compass that turns them 90 degrees to the left when every other individual heads directly south. The birds keep traveling until they reach the end of land which, on the east coast, is the little nub in the easternmost part of the state. And in that way three Swainson’s Hawks get funneled into one place where so many people can view them. But Swainson’s have been wintering farther north over the last 20 to 30 years, largely a function of the clearance of land that was historically scrub and forest for irrigated agricultural plots in much of Central America. Ironically, while this sort of habitat degradation is on the whole bad for numerous species, the Swainson’s Hawks prefer the newly wide open vistas, and so long as the weather is warm enough to support flying insects, there’s no reason to continue down to Patagonia. So they stay, in ever increasing numbers closer and closer to North Carolina on a regular basis. The Roughlegs, though, are likely a result of the epically brutal winter in parts of their regular non-breeding range. They’re certainly no stranger to deep drifts of snow and icy temperatures, but colder than average temperatures push them just that little bit farther south into this part of the country. This year has been exceptional, however, with reports of birds in Mississippi, Alabama,and even Florida. Is it that simple, though? Is the weather all there is to it? Once again, it’s impossible to say for sure. Other tundra species with similar requirements and booms and busts, like Snowy Owls, have been nearly completely absent from their regular sites this year, so there may well be something else going on that’s specific to Rough-legged Hawks. In any case, the fact that they’re here, and so conveniently located has made area birders pretty excited. Because if you’re a Buteo, it doesn’t matter where you come from. Apparently, all roads eventually lead to North Carolina. It’s coincidental that this post dealing with Buteo species comes a couple of days after I wrote a post clarifying a query re: hawks and buzzards. I’m not implying anything of course, I just like the timing. Well, then I’d like to see you tell a 2nd CY Common Buzzard from your Red-tailed Hawks! As a matter of fact, this is something I’ve worked on for a while as RT has been found in Europe once or twice now. And considering Common Buzzards are migrants, they could conceivably turn up in NC just the same. @Thonior- I think winter makes people think of waterfowl and hawks. I certainly have hawks on the brain these days, I can’t fault anyone else for the same! @Jochen- Is Common Buzzard even a Buteo? I couldn’t tell because you Euros gave it that ugly name. Are any of those sites within your big year territory? @Nate: I find the buzz surrounding “Buzzard” bizzar (yeah, I know there’s a typo, but the joke is already flat enough as is, and likely wouldn’t work with “bizarre” spelt correctly). Regarding the ugly name, I protest my innocence as the bird is called “Mouse buzzard” in German, or sometimes – inofficially – Cat Eagle (due to its call) – and the latter absolutely kicks donkeys. @John- Unfortunately no. Otherwise I would have already picked them up! @Jochen- Cat Eagle is most excellent. It sounds like a name my kid would make up. Of course I don’t want to tackle an out-of-range Asian Buteo, I want the hot Cali birders to do it for me and I can gape in amazement from afar. Not to be a negative nancy, but is there actually any data that proves Swainson’s Hawks are changing their distribution due to habitat loss? I reckon part of the reason they are found wintering in the US more regularly is that there are thousands more accomplished birdwatchers out there now than there were 30 years ago. Like I said, I don’t know enough to be certain, but it seems like a plausible explanation. Cool graphic! Ebird is taking over the world. We found a couple juvenile SWHAs (presumably wintering) in eastern Mexico a few weeks ago, but considering how many are being found north of there in winter it wasnt too shocking. Where Are You Birding This First Weekend of December 2010?